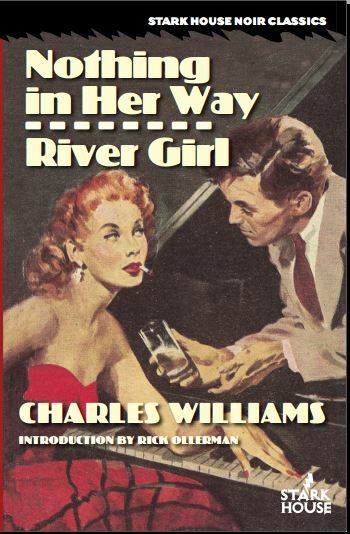 Charles Williams appears on many "best of" lists when talking about favorite Gold Medal or other paperback original (though he had a few hardcovers--let's not be picky) though much of his work is notoriously out of print. Shipping this week is the first Stark House volume of two of Williams' classic works. If you haven't read Williams before, you are certainly going to be glad you did. The best of all the Gold Medal writers. The tone, pacing, and atmosphere of the whole book are pitch-perfect. No wonder River Girl is one of my favorite Charles Williams books. Happy New Year! Whether that means promises of weight loss, weight gain, unused gym memberships, whatever, we hope that 2014 is a wonderful year for you and yours. Stark House Press is entering its fourteenth year, quite an accomplishment for a small press. Technology makes it much easier for someone to start their own publishing company, but the trick is to be able to sustain it. We've been able to do it for a long time now and that's thanks to all of you, our readers and customers. In a recent issue of the fan publication Deadly Pleasures Mystery Magazine, editor George Easter wrote in his "From the Editor" column that he was talking to a representative from a newer publisher. They have plans to publish books by established writers as well as newcomers. As you know, Stark House is doing much the same thing, though on a smaller scale (the other publisher is really part of a very large company). Easter cautioned "that he must avoid mediocrity. This has happened in the past with publishers such as [REDACTED] and [REDACTED]." It takes a lot of time to create a quality book, be it print or electronic. There are many so-called publishers out there who do no more than scan and print the contents of older books, with no attempt at editorial control. Not only do they reprint the existing typos (and believe me, they're almost always there), but they introduce even more errors through the OCR portion of the scanning process. Our books are proofread, we seek out writers and provide introductions that are hopefully not only informative but interesting to read. We publish complete bibliographies in every book. For our upcoming John Trinian volume, we have an introduction by an impartial observer, a short piece by the author's daughter, and as of now we're waiting on yet a third essay written by a personal friend, a musician and writer who knew Trinian (or Zekial Marko rather) as a friend. In short, we try to put in the time to do it right. Most of our books contain more than a single novel--some even have three--giving even more value for your buck. And to date, we've published new works by four authors, and we hope that number continues to grow, but only, as George Easter puts it, if we continue to "avoid mediocrity." Last year we passed on two manuscripts that went on to find homes with other houses and we sincerely hope they're doing very well. For various reasons, we just didn't feel they were a fit for Stark House. What we see now, at the end of the year, are a few notices that help us feel we're on the right track. Woody Haut: Best of 2013 by Woody Haut. The King of Noir Woody Haut picks the best of 2013. Mr. Haut lists his favorite ten books of the past year and included in that list is TWO Stark House books, Black Wings Has My Angel by Elliott Chaze (paired with what he calls the "excellent" One Is a Lonely Number by Bruce Elliott), and Arnold Hano's wonderful 3 Steps to Hell. And what's more, Haut adds a section of "other favorites" that he calls "Bubbling Under" where he lists Dana King's debut Grind Joint. That makes THREE Stark House offerings (out of fifteen) on that list. One of the best books I read this year was Paperback Confidential, which studied writers active in the original paperback market in the mid-century. "MIDNIGHT ROAD, Jada Davis (another almost lost hardboiled masterpiece from Davis, and a fine coming-of-age novel at the same time) "
That's enough self-recognition (for now, anyway). To all our readers and subscribers and fans of crime (and other) fiction, we sincerely wish you all the best in health, happiness, and literary virtue for the coming year. If you wish to get our latest releases still warm from the printer's presses, you can always sign up for our Crime Book Club and take advantage of discounts and deals on back list titles for new members.